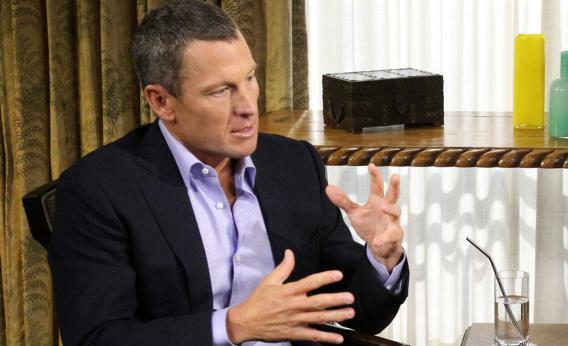 Lance Armstrong’s Oprah interview: His threats and bullying are the real story. Lance Armstrong wants you to forgive his doping—and forget his intimidation tactics. Lance Armstrong telling his story to Oprah Winfrey. That’s the key line in Lance Armstrong’s interview with Oprah Winfrey. Unable to preserve his initial story—that he never doped—Armstrong is peddling a new story: He doped, he lied about not doping, and that’s all there is to it. Armstrong rode [Simeoni] down and threatened [that] if Simeoni did not return to the peloton Lance Armstrong would stay with the break and doom it to failure … As Simeoni and Armstrong fell back to the peloton, Armstrong verbally berated Simeoni for testifying in the Ferrari case, saying, “You made a mistake when you testified against Ferrari and you made a mistake when you sued me. I have a lot of time and money and I can destroy you.” Armstrong was captured on video making a “zip the lips” gesture which underscored what Armstrong had just said to Simeoni about how Simeoni should not have testified against Dr. Ferrari. exchanged text messages in which they discussed doping on the U.S. Postal Service team, Mr. Vaughters’ texts became an exhibit in [a court] proceeding. … Since that time, Mr. Vaughters’ employer, Slipstream Sports, has received several phone calls from Mr. Armstrong suggesting that Mr. Vaughters should be removed from the management of Slipstream Sports.